The AMO editors have been hard at work, reviewing 255 add-on updates and submissions in the 2 weeks before Firefox 3’s launch, and 238 updates/submissions between launch day (Tuesday) and Sunday. There are currently 228 updates in the queue and 373 new nominated add-ons. There are normally about 10 new add-ons submitted to AMO every day, but since the release there have been 20-40 every day. Similarly, there are normally about 60-70 updates to existing add-ons every day, but since the launch there have been 100 – 150 every day. 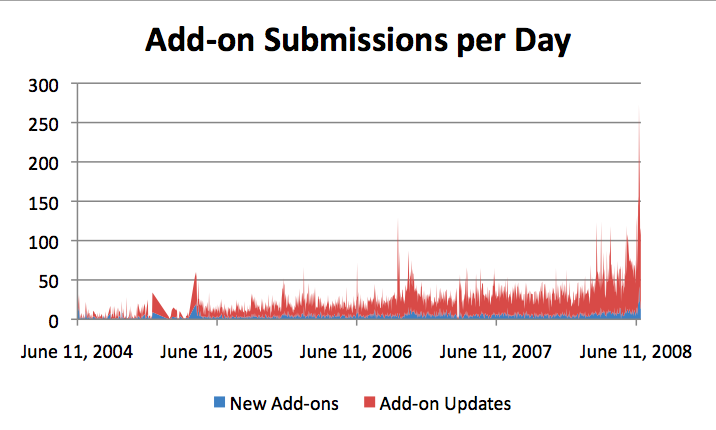 Below is a graph of submission and update rates since 2004, hitting a peak of 235 updates on the day after release and 42 new submissions 2 days after release. You can also see a zoomed-in version of the graph. 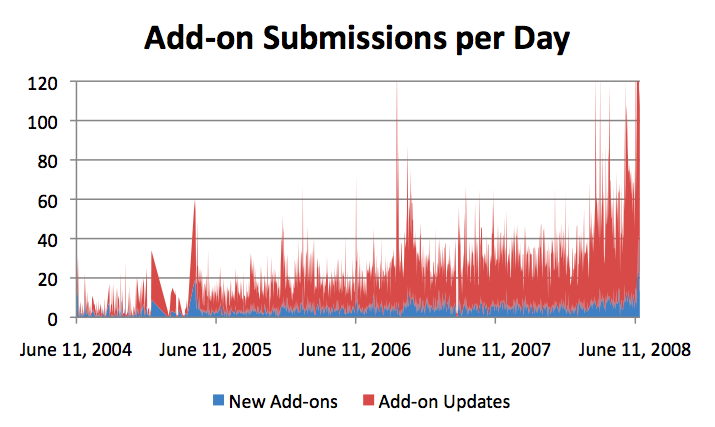 Astute observers will also notice a large increase in submissions in November 2006, when Firefox 2 was released. Please be patient as our editors work through this backlog. You can read more about volunteering if you’d like to help. A huge thanks to all of the editors who have donated their time and effort to make sure Firefox 3’s add-ons experience is great. Below is the list of editors with the number of reviews they’ve done since March 2007.